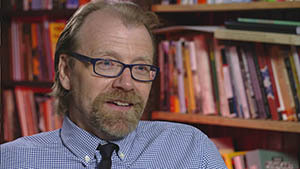 “The Book of Saunders,” an up close and personal look at American short story master George Saunders, will air Friday, May 16, at 9:30 p.m. on WCNY TV. In 2006, he was awarded the Pen/Malamud Award for Excellence in the Short Story and was included in Time’s 2013 list of the 100 most influential people in the world. A recipient of the MacArthur “Genius” Award, he teaches in the Creative Writing Program in the College of Arts and Sciences. The documentary, premiering on WCNY TV, is a production of Syracuse University Electronic Media Communications. Stu Lisson, executive producer and director, credits his production team and WCNY for helping share Saunders’ inspiring story with Central New York viewers. WCNY also has plans to air an interview with Saunders at a later date.